Dustin Rathgeber’s great grandparents were market gardeners, and his grandpa, born into market gardening, had a huge backyard garden of his own. After losing his grandmother in 2014, Dustin left his college state of Florida to move back home and pick up his farming family’s legacy. He dropped everything to refocus on family, and found no better place to do it than his parents farm in Odon, Indiana. A conventional farm till ‘97, Dustin set to sectioning off and reworking 8 acres in late 2015. By June of 2016 the land was certified organic. Last year marked his first season as a Linton’s Farmers Market vendor. He also sells at Bloomfield Farmers Market and through local CSAs. Rathgeber’s Garten, the ‘t’ an ode to his German roots, provides fresh, organic produce to Linton’s community of 5,400 residents. Looking down the rows, Dustin rattles off radishes, sugar snap peas, cabbage, carrots, tomatoes, zucchini, summer squash, beets, and onions as current field inventory. Dustin is rightly proud to grow his community fresh produce, and participating in the market is the heartbeat to his business. 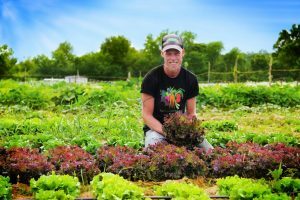 Dustin’s organic produce has been a hit at market- earning him loyal customers and the appreciation of a tight-knit community. He farms for his neighbors and carries on the Rathgeber farming tradition. On nice, cool Indiana days, Dustin’s 90 year old grandfather often makes an appearance out in the fields, helping his grandson turn over the Garten with seasoned care.